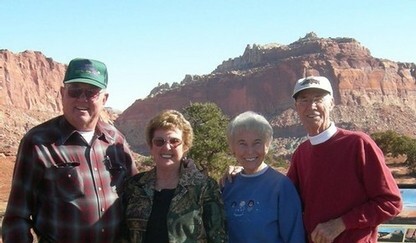 Lt. Bob & Beverly Nilsson, Howie & Bev Steinbeck November 2009 The B-26 CRASH site - look for the American flag! Four out of five men survived "The Crash" on the stormy day April 11, 1956. The B-26 Maurader landed just 200 yards from the family home. 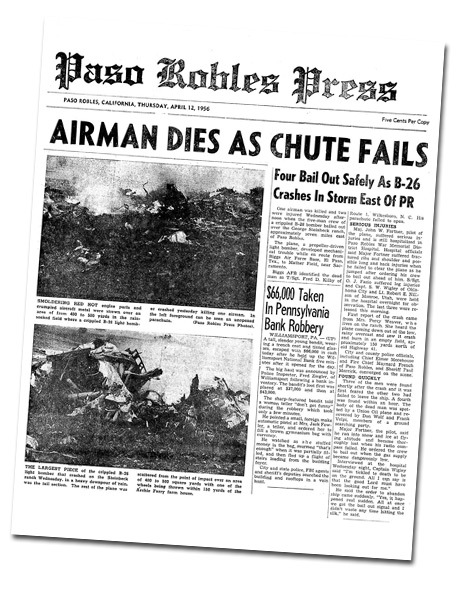 Howie's parents George and Hazel Steinbeck watched the plane hit the ground and explode. They witnessed parachutes coming down so they ran to rescue the men. The Captain was brought into the family home and kept alive until medics could attend to him. Since naming our blend THE CRASH we searched the internet and found that two crash survivors, Lt. Nilsson and Sgt. Fazio are still living. THE CRASH reunited these two men who had not spoken in 53 years (each went their own way in military service after the event on our property. Mom and Dad visited each family, the Nilssons in Utah and the Fazio family in Massachusetts. The men gave their firsthand account of the day's events, recalling how thankful they were to see the green fields of Paso Robles beneath them as they broke through the fierce snow and hail storm. Pieces of the B-26 are on display in our tasting room as is a detailed display of the story. Be sure to grab a splash of THE CRASH as your imagination takes you back to 1956. Lt. Robert Nilsson recounts the events of the crash in a letter to his parents just 3 days after the crash. I want to say that I am mighty thankful to be able to sit down and write the experiences which could have proved fatal. I know God was with me, maybe even more than with the other fellows who made it. I hope Bev called and told you what happened before you were to hear it on the radio or in the papers. Looking back it seems almost as if it never took place, but there is no doubt of what did happen. To begin with, we left Biggs at 10:05 a.m. flying by Tuscon, Ariz. then up the coast. We were to refuel at Mather A.F.B., Sacramento, Calif., then to continue on to Moses Lake, Washington where we were to pick up a C-45 and ferry it back to Biggs. After passing Bakers Field, Calif. we ran into heavy snow, but we were on instruments and everything was functioning accurately. Then approximately thirty minutes from Bakers Field we lost radio contact but continued on our present altitude. Then with thirty minutes of fuel left, Major Fortner called on intercom and said we were lost, that we had better put on our walking shoes in case of bail out. Just at that time we broke out of the clouds and could see the ground. This lasted for five minutes. I thought at this time the major would go down under the overcast where we could orient ourselves, but for some reason, he continued straight into the clouds. At this time Sgt. 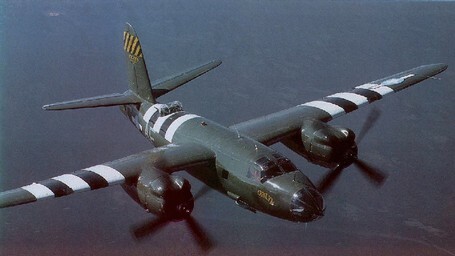 Fazio, who was in the back of the B-26 with me, knew that we had to bail out or have radar help but quick. The major called on interphone and asked what we thought of going down through the stuff and trying to land, but we never what was below us, whether it was mountains or water, we decided to climb for altitude. Reaching 9000 feet, the order for bail our was given. In order for the man in the nose to get out and clear the aircraft, he had to go first. I have no sence of time that took place from the time the order was given to hit the silk and the time the captain in the nose went out. I do know that for several minutes the major pleaded and begged the captain to leave. I have never heard a man so desperate in my whole life. Finally the captain did get out and the bombay doors opened for us. I told Sgt. Fazio to get out, which he did at once, but as he pushed himself out his feet slipped and slid under the seat. His body was dangling out in the bombay and his feet in the plane. I don’t know where I found the strength to pull him back in, but I did. He was pretty shook up, but he tried it again, (all this time we were going down) but his chute hung up in the passage way. I finally got him free and pushed him out. I don’t know exactly what took place, but I realized the mistakes the sgt. made, and I made sure I didn’t repeat them. As it happened, I didn’t have any trouble getting out. I remembered that I should roll myself in a ball and wait a few seconds, about the time I figured I was free of the plane, I saw it making a right turn about ninety degrees to the right. Then I pulled the ripcord. I felt the pilot chute open, and then I blacked out a second, but the parachute had opened and I was coming down through the snow. The blurry photo doesn't show the B-26 engine that torpedoed its way 13 feet into the ground in the field 100 yards south and east of the historic ranch house, Cindy's home. Four of the five airmen survived the crash and were triaged in the family home until medical help arrived. This event is commemorated by The Crash blend. I kept thinking about what I had in case I was over water or mountain. Then all of a sudden, I heard another aircraft coming toward me. Believe me, then is when I prayed. Up until then I knew what I had to do and how to do it, but to be in the parachute and having an aircraft coming toward you and not being able to do anything about it, well, I just prayed. Then I heard it fade away. I couldn’t see a thing the snow was so thick, and I started to get real cold. I guess I broke out of the snow about a thousand feet above the ground. I have never seen anything so wonderful as the green fields below me. I heard the aircraft crash and then saw the captain already on the ground. I was coming down toward a bunch of trees, but I remembered in school they said to turn yourself down wind and pull the canopy, which I did. After clearing the trees and getting ready to hit the ground, I thought if I pulled myself up just before I Hit the ground it would lessen the shock. This I did, and I didn’t hardly feel any shock. The rest was routine, notifying the base and the ambulance. Then we went to the hospital where they took the sgt. who broke his shoulder and the major who was broke up all over. One thing I will never forget, and it makes me feel like I was really worth something. When we went into the sgt.’s room, all the majors and colonels went over to his bed, but the sgt. never said a word to them. He just motioned for me, and said, “I owe my life to you for saving my life. If it hadn’t been for you I would have never made it.” The sgt. who never made it was hit by the aircraft as he bailed out and never knew what hit him. I never received a scratch or burn. I guess I had everything just right and the Lord was with me. I hope you are all alright, and that I can see you before I go to England. All my love to two Wonderful Parents.